I know it’s springtime, but I am a soup eater year-round and this soup is something you will want to add to your menu immediately! It’s so simple to throw together and is perfect for those busy weeknights when you need a fast and filling dinner. A fast and filling dish that comes together in a matter of minutes! Cook chicken tenders according to directions on package, then cut into bite-sized pieces. Set aside. In a large pot, heat oil over medium heat. Add onion and cook until tender (about 6 minutes). Add garlic and cook until fragrant, about 1 minute more. Stir in tomato paste and crushed red pepper flakes. Add diced tomatoes and chicken broth and bring to a simmer. Let cook for 5-6 minutes. Add pasta and cook 6-8 minutes more, or until pasta is al dente. Right before serving, mix in cooked chicken, Parmesan and mozzarella until just melted and season generously with salt and pepper. Ladle into bowls and top with parsley. 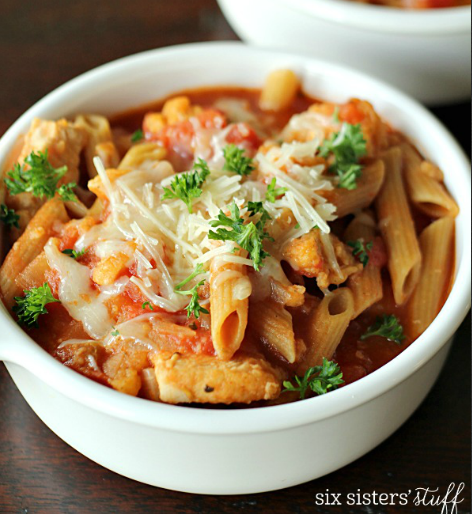 Do you use the oven ready, breaded frozen chicken tenders for the chicken parmesan soup? Yes, that is why this recipe is so easy. Thanks for stopping by our blog! An even speedier version is when I buy the chicken tenders at the deli. One less step for me to worry about! Do you know the calorie per serving for this, and how much is in a serving? Hi Lil. Just click on the MAGIC button under the picture on the blog post. Then click on NUTRITION in the upper left side. It will give you all of the nutritional information on this recipe. Thanks for the nutrition info. Also can something be used in place of tomato paste. I don't have any and want to make this now. I do have tomato sauce, soup, diced tomatoes. this looks really good and great serving idea, thank you for this!